Welcome to the launch of Idahoans for Local Education. This website is meant to be a resource for Idahoan parents, citizens and educators to find resources about the Common Core State Standards and other attempts made by the Idaho Department of Education to diminish local control of education. Our mission is to preserve Idaho’s local educational sovereignty by keeping the decision making close to home, where parents can make a difference. We want to make sure that Idaho‘s education system has the highest standards so our children are given the ability to be anyone they want to be. We’re not in this fight alone. Idahoans for Local Education is also a member of Truth in American Education which is a coalition of different organizations fighting against the Common Core. If you’re not sure what the Common Core is you can learn more here (as well as keep an eye on our website!). Here is a timeline of how the Common Core was implemented in our state. You can learn more about Stephanie Zimmerman our founder here. 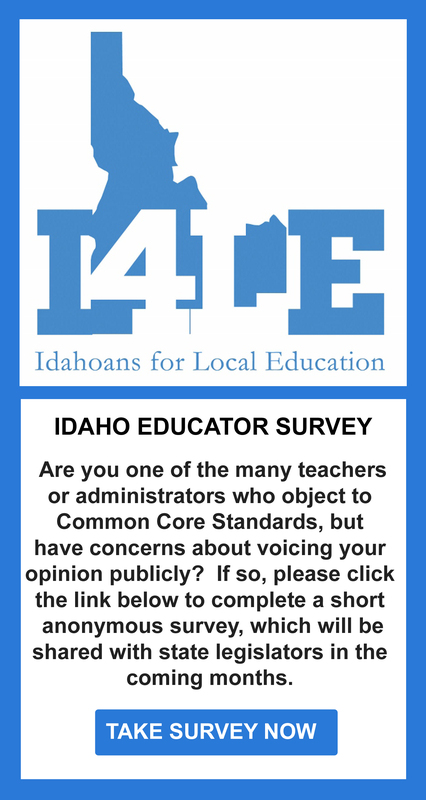 We’d love to hear your stories about the Common Core’s implementation in our state or other goings on with education in Idaho. Please contact me with any news tips at info@idahoansforlocaleducation.com.